The co-chairs are Carol Cohen and Mark Macgowan. Committee members are Martin Birnbaum, Mark Doel, Charles Garvin, Dana Grossman Leeman, Kyle McGee, Olga Molina, Barbara Muskat, and Mark Smith. Group Work Track at the US Council on Social Work Education Conference (November 8-11, 2018 in Orlando, Florida, US). View photos from the event here. 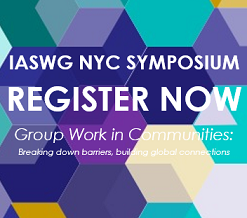 The IASWG Exhibit Booth (#518) will open on Thursday evening 11/8, immediately following the opening Plenary speakers. Please contact Brian Kelly ([email protected]) as soon as possible if you can serve as an IASWG representative at the Booth at any point during the Conference – And please stop by and say hello. Calling all Syllabi for Posting: We have posted new group work syllabi on the IASWG website but we need more! Please send your syllabus to [email protected]. We welcome members’ submissions that focus on group work, or include group work as part of a course at any educational level. Consider Applying for IASWG SPARC by the next deadline, May 15th, 2019: IASWG members are encouraged to apply for a SPARC award of Endorsement or Endorsement and Funding. Information and application details are available on the SPARC webpage. The original mandate of the Commission on Group Work in Social Work Education Committee focused on the strengthening of the teaching of social work practice with groups in social work schools and programs in the United States. At first, through joint efforts with the Council on Social Work Education (CSWE) in the United States, two texts devoted to teaching social work with groups in the advanced practice curriculum and in the field were published. Work with CSWE and the Baccalaureate Program Directors (BPD) in the US ensured that workshops on teaching social group work were available at each of these organization’s annual conferences. The work of the Commission was expanded in 2002 to Canada. Outreach was made to all the Canadian Schools of Social Work, inviting schools to develop relationships and work cooperatively to enhance students’ preparation for social work practice with groups. The Commission is continuing to explore possible relationships with CSWE, BPD, and Canadian Association for Social Work Education (CASWE). We will also focus on ways to develop stronger relationships with other social work education organizations and schools internationally. An ongoing project of the Commission has been the exemplar group work course syllabi exchange, available to IASWG members. The syllabi exchange features syllabi for undergraduate, masters and doctoral level coursework and can be found in the Resources section of our website. Currently, we are focusing our efforts on enhancing the teaching resources section on the IASWG website. If you have a course syllabus or other teaching resources for consideration for posting on our website, please send them to: Carol Cohen or Mark Macgowan.